Evo & Grace: The WanderLusts: Jessica Sanchez' Debut Album Out Now! ME, YOU & THE MUSIC, OUT NOW!!! Jessica Sanchez — the 17-year-old California native who won over American Idol viewers with her diva-worthy vocal range — released her debut single, “Tonight” featuring Ne-Yo last March 21st. Her single is now enjoying heavy rotation on radio and TV Channels nationwide and also charting Top 1 -5 on radio station all over the Philippines. Me, You & the Music, Sanchez’s high-energy, beat-soaked debut album, released yesterday, May 14 on MCA Music (Universal Music Philippines). 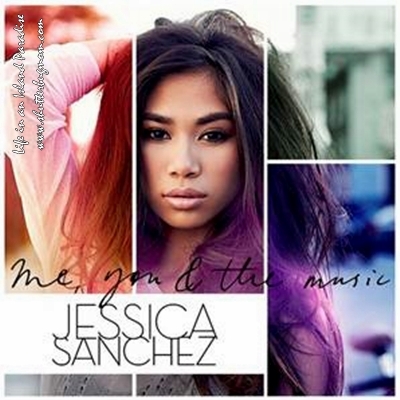 Me, You & the Music features production by Benny Benassi, Harvey Mason Jr., Ne-Yo, Rodney Jerkins, Stargate & Toby Gad. Born and raised in Chula Vista, California, Sanchez has worked on honing her vocal versatility for almost her entire life. She started singing when she was two and lists Mariah Carey, Etta James, and Ray Charles among her musical influences. At age ten she performed Aretha Franklin’s “Respect” on an episode of Showtime at the Apollo. A year later, she competed on the premiere season of America’s Got Talent, reaching the wild-card round before getting cut. Over the next few years, Sanchez performed at venues both large and small (including a 2008 San Diego Chargers game) and released a number of covers (such as Etta James’s “I’d Rather Go Blind”) through an independent record label. After nailing her American Idol audition in 2011, Sanchez climbed to the final two and landed her deal with Interscope soon after the season finale. Diving into the recording of her debut last summer, Sanchez took a break from the studio to tear through a rousing, choir-backed rendition of Marvin Gaye’s “All I Need to Get By” at the 2012 Democratic National Convention. MCA Music Music, in cooperation with Odyssey Music and Video and Astroplus brings you to “Blujays Fan Party!” Jessica Sanchez 'Me You and the Music' Album launch @ Odyssey Megamall, May 18 (Sat) 4PM-7PM and on May 19 (Sun) 4PM-7PM @ Astroplus SM North Edsa The Block.